I was almost about to give up on blogger today - I tried several times this morning to post only to repeatedly receive the message that blogger is unavailable right now. tried again a bit after 3 pm, only to receive the same message -so, I went to the blogger help forum and learned that the problem started yesterday - someone claimed at least twenty states and four different countries have been having the problem I was having. the claim blogger gave that it was a temporary, isolated problem, was a tad of an understatement. now blogger's back so no one has to to cry. as if we would. but it was frustrating, especially when I want to have a more respectable presence in june than I had last month. I do have a wander coming up at the end of the week; you know what that means! anyway, now it's midday, I don't have time to prattle on, but I wanted to post a photo of this neat spiral herb garden I saw friday night when we were at the cleveland botanical garden for a wedding (terrific place to have a wedding, by the way!). the little sign gives simple, concise directions about constructing a herb spiral - of course, there's a plethora of info out there on the web - this post from a blog called 'welcome to voluntary simplicity' is quite lovely with advice, for instance. csn&y in 1970 performing on the tom jones show. oh my, look how young those boys are - and what about those sideburns! we just don't see sideburns like that anymore. can you believe this was filmed 40 years ago - eh, what FORTY YEARS AGO, it seems like just the other day. tempus fugit! Pretty cool idea if little to no space. Thanks for the links. I love my herb garden; we just put in some borage seeds this spring and now they are flowering. they'll take over, if not monitored. And it did. When the band came out, they were gleefully waving the frong page of the Newark Evening News (long deceased) with the anticipated headline: NIXON RESIGNS. No problems with Blogger here; I got my stuff uploaded and posted with no problem. I had a circular herb garden once. It wasn't a spiral, but rising concentric circles. And yup, made with bricks. I had a whole summer of pesto. YUM! Thanks for the CSN&Y; best vocal harmony in the business! I had the same blogger woes since last night. What a pain...even worse was trying to figure out where I could report my problem! Ugh. 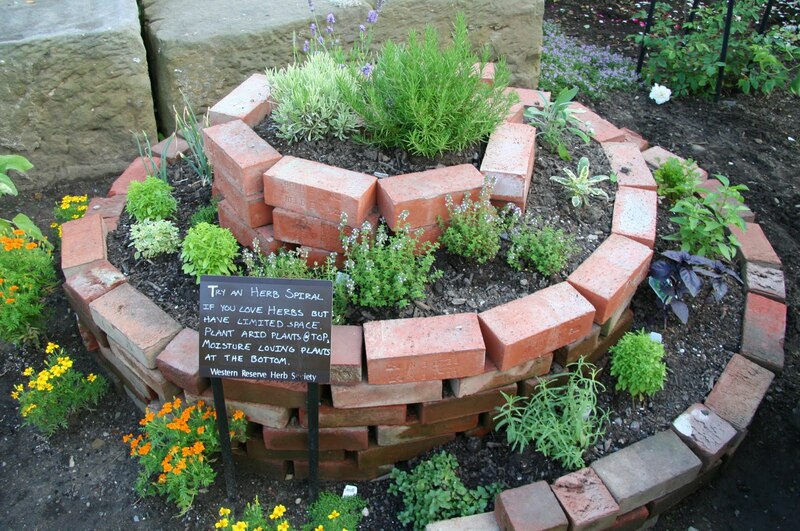 Love this herb garden and the offer to plant or take what you need! So sweet! The herb spiral is wonderful! Glad to hear Blogger is back to normal. This time it didn't effect me (knock on wood). I love herbs. And I love bricks, too! That's rather a clever idea - although I suspect someone in Babylon had it first.